I have been planning for Eliza to start on gym classes after she has completely recovered from her cough and this swine flu thing comes. While it reportedly haven't reached SG yet, except for some suspected cases, Ww doesn't want to take the risk and even instructed my in-laws not to bring Eliza downstairs for her morning walk. 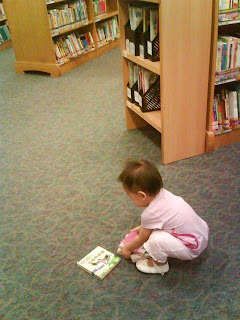 I'm not sure if she did go for her usual morning walk but they brought her to the library in the afternoon anyway. Anyway, he also said it's better she don't attend the gym classes until this pandemic is over. I'm uncertain if it's ok that she attends this week. But i think i'll wait and see how the situation goes, and if everything's ok, we'll go ahead with next friday's class. 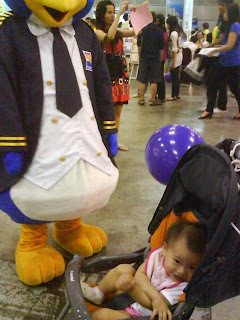 Last last friday we went to the travel fair at Suntec cos my mil wanted to see where she can go for the june hols...guess what..she's going Genting, again! 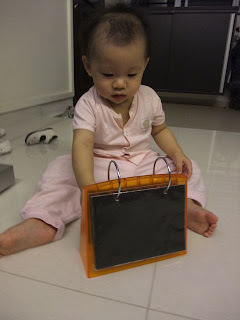 Well, it's a wonderful progress to the love of books, like her mummy & daddy. I can't remember where this is already. 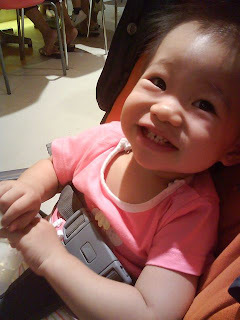 Love her sweet grin...which she'll give on cue nowadays. Depending on her mood, Eliza can be quite a sociable girl. She was so happy seeing the kids and the girl in the photo trying out sunglasses that she was making communicative sounds to them. Really cute seeing her trying to 'talk' to the kids. Eliza trying to pick out some nice clothes with ah-ma? She was quite pleased with wearing the cap..and loved the shoes on display. 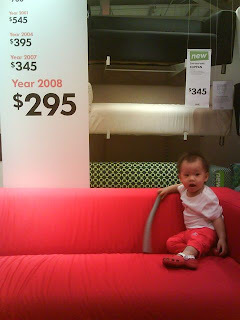 We joined BK & Huey on their Ikea shopping and Eliza excited to climb onto the sofa....too bad it was too big for the space they wanted to put their new sofa at. And you know how much she loves to carry heavy stuff...she attempted carrying the carpet...after seeing Huey carry one to the cart. Oh, Eliza was almost successful in lifting it up. Strong girl. 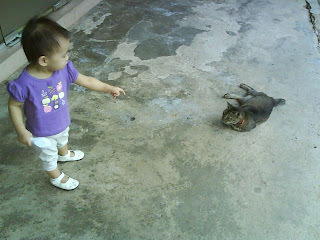 I would believe that she likes cats because she keeps seeing the real one all the time. She wanted to touch it but i didn't let her, and after that when the cat attempted to get near her, she'll run to me and ask to be carried. Still i missed Eliza loads. As i only come home to quickly bathe and eat dinner before putting her to sleep, i don't really play much with her. I rather particular about bedtime and feel that as much as i can, i don't want to push her bedtime late especially if she missed her afternoon nap. On one of the nights she was so overtired that while crying & struggling to get out of the bedroom, she fell asleep in my arms in 10mins. I was quite amazed. 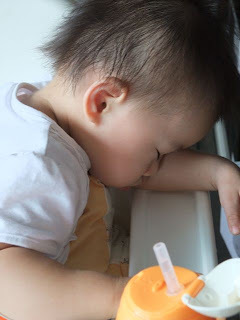 It also convinced me that an overtired baby is a difficult to settle to sleep baby & that sleeping on time & early is really important. Anyway, it's not the most fun being the 'bad person' chasing her and 'forcing' her to bed. Eliza's expanded on her talking to..
Ww once comment that i don't really buy clothes for her and when i though of it...it's quite true...i would think that I only 20% of the clothes she wears. She has been blessed with many people who showers her with really nice clothes. 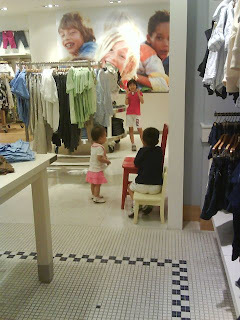 Her grandmothers love buying clothes for her, or at least her ah-ma always looking out for pajamas. Some are birthday gifts, some are from my dad, from friends in church, from Ww's 6/10 students and their parents (they're really sweet...), from my SIL who adores buying baby girl clothes. I also haven't been taking much photos lately, I'm not sure why...but here are some recent ones. 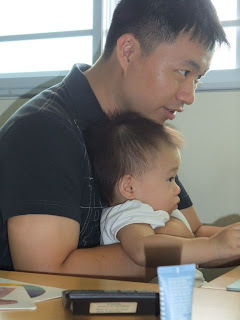 Daddy watching powerpoint flashcard presentation with Eliza. 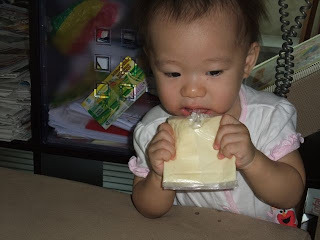 It was one of the things she now enjoy....ok or demand for...if we sit at the computer. It's also where she learnt to say 'onion' and '马'. 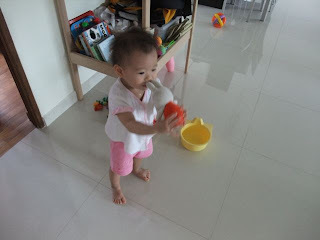 Eliza also 出 pattern all the time....that amuses us. Stuff like putting her legs under the mat...and also under the sofa when she wants to hide from us. 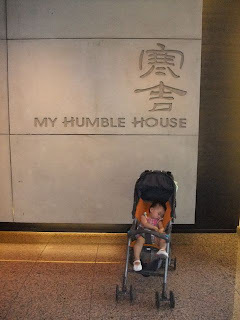 We went to eat at Humble House last sunday to celebrate my MIL's birthday and Eliza was taking her too-late afternoon nap. Wasn't the best time to sleep and wake up either...still we all enjoyed our dinner, including Eliza. It was superb! This is classic. I don't think i'll ever catch her doing this much. She fell asleep after dinner while watching Baby Signing Times...well, it was at the end already and the song was quite soothing too, so that made it easier for her to sleep. 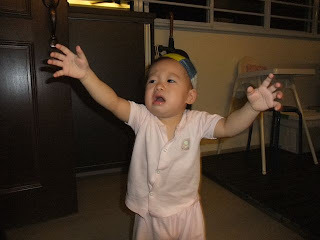 This is what happens when she misses her afternoon nap, cannot tahan the evening liao. I started reading Gina Ford again, this time the Toddlers book. Everytime i read GF, i always feel like i need to be more consistent and more firm on some things. Bedtime is one. GF has this quite fixed routine which don't find that Eliza can fit into that schedule (wake at 7am, 1 nap, and sleep at 7pm). Yet after reading about some examples in the book and about the issue of sleep, i felt that it did make quite good sense. Eliza's body clock is switching to a 2 nap to a 1 nap day. Essentially she needs 2hours of daytime sleep. Sometimes she sleeps more, which i rationalize that it's due to some late nights on some days. The problem with the switch is that she'll go down for a late morning 1+ to 2hr nap and last till bedtime which is 9pm++. It's usually out of my control during my work days cos my mil will try to let her stay awake till i come home, also worring that if she sleeps to early, she'll wake up very early and disturb me. I always wondered why it takes 1hr to get her to sleep (inclusive of the chasing to sleep and playing in the room etc etc). 1hr seemed too long till i heard of my friend who also took that long as well and i am kinda relieved that it's normal. Still reading GF is making me wonder if her hyped up and easily sparked off mood is due to overtiredness. And if we put her down to sleep at 7+pm (after she woke up at 1pm from her last nap), would she sleep better and would she sleep through well? 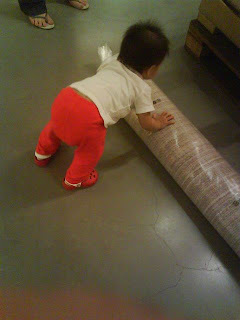 I have yet to dare to try it, esp wondering if i risk having to wake at 4am to play with her. Today i somewhat manipulated her nap. She woke at 645am which was earlier than normal, so i thought she might be sleepy enough to fall asleep by 10am or on our way back from the market. Alas, it took quite some crying and her wanting things that aren't permissible before falling asleep at 1115am. Since i had to go meet a friend at 130pm, i woke her at 1215pm for lunch. 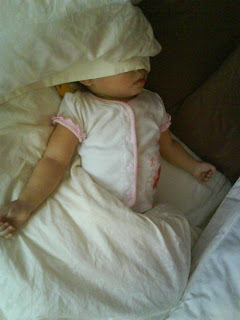 I knew if i let her sleep, she'll will tahan till 9pm to sleep after that nap. And i knew if i woke her up she'll surely be tired enough to take an afternoon nap. All went according to plan, though she slept much longer than i expected for her afternoon nap and so i put her to bed slightly later at 930pm. Interestingly, she dropped off to sleep by 10pm, without much attempts to get out of the bed to play or whatsoever. So is overtiredness a reason why she's so difficult to coax to sleep at night? 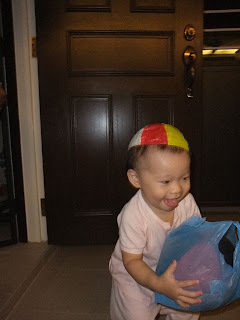 We have put the potty in the kitchen for quite a while already and Eliza has all kinds of ways to play with it. 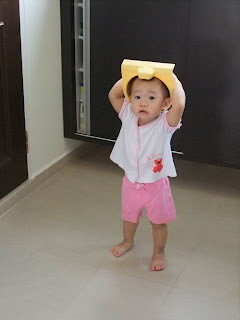 most of the time she loves to put the potty part on her head like that. you know, kids at this age doesn't fully comprehend what's clean or dirty...or at least she doesn't know what it really is for, for now. Also...i wonder why most of these photos i have of her like that are at the balcony, near the main door. She thinks it's a cool hat? Parents, please don't let your kids try this at home. It doesn't stop her from sitting on the ball at other places. Ww says she has strong thigh muscles. I do feel that Eliza's quite neutral towards her stuffed toys...she doesn't like one more than the other and it's quite a random thing when she chooses one over another. I wonder why she occasionally tries to smell Miffy's ears. I wonder why Eliza has to scratch herself so much (ie her elbow & arms, her lower back, behind her knee) when she's falling asleep during bedtime. I really am not sure if it's cos she's really itchy or her fingers are itchy. The problem is that it only happens at night. Daytime naps are quite free from scatching. I would believe it'll take her half the time it takes to sleep, if she doesn't need to scratch so much. I mentioned to the PD who gave some meds that's for allergy but it didn't really help so i stopped feeding her that. Eliza is becoming quite attached to the pacifier, and even though we limit it to just bedtime, on days like today, she'll take the liberty to use it beyond the bedtime or naptime. 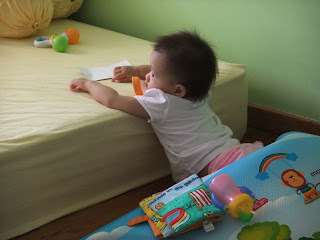 I have always gotten her to puipui out her pacifier to her cot when she wakes up in the morning, which she has done quite well all the time. Today after waking up from her nap, she refused to remove her pacifier and wanted to go out. I insisted the pacifier goes. She insisted it stays in her mouth. In the end i managed to get it out of her, though not without much protest and crying. Sigh...when can i wean her off the pacifier? I have been devouring parenting books ever since Eliza was born. And the library have been a really great resource of all these good books. 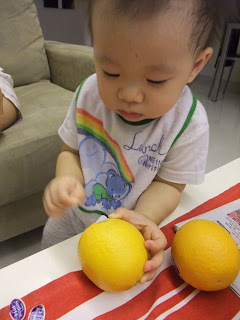 the infant years was a lot on baby care and the handling all the basic needs of food, play and sleep. As Eliza's now approaching 1.5 years, a lot of books i read now has moved on to more developmental stuff... sometimes i wish i can remember all i read but alas, no. i've learnt a lot from reading these stuff, though i really wish there's a mummy group where we can share more & support each other on raising our kids to have the heart of Jesus. 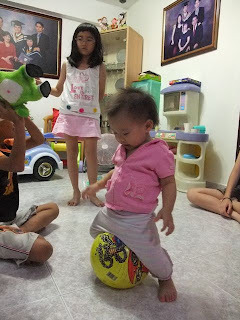 that's the part i'm really not sure about...and it'll surely be great to learn from more experience mums. A thought came to us last night while we were talking, that as much as my mil really takes fantastic care of Eliza, we're her parents, and we're the ones who thinks ahead ahead of how she's growing developmentally, spiritually & morally. I'm the one who's quite particular about her tv watching amount (which is quite a lot with my in-laws cos they turn on the tv all the time), so i'll draw her away from the living room and so the tv to play in the room instead. But she's getting so-called better at watching tv nowadays...and especially the baby signing times dvd which we play during mealtimes. The problem is that she'll keep her food in her mouth and now swallow...hai...so i'll pause the show until she swallows it down. Eliza's expanding her signing, although there are some gestures which she does that i'm not sure what it means. 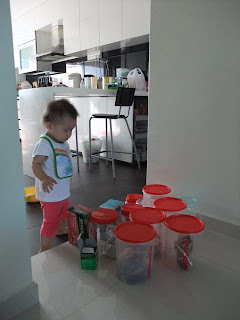 It's really quite fun watching her grow... watching her totter around the house being quite busy doing this and that, or playing with her on the bed rolling around and plopping onto the bed, or laughing at funny stuff that she or we do, listening to her talk. really fun! These are a rare series of photos taken by Ww..while i wasn't around. 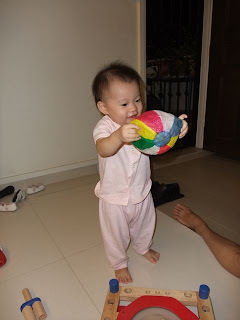 Eliza is very excited that ah-gong comes home with a new ball to play, kids just love playing with balls eh? I now have 4 balls of different sizes at home, there was 5 but the boys burst one of the big balls...i wonder how they did it. Eliza being quite unhappy that the ball has been taken away, it had to be washed. This was Eliza's fav photo frame for a while, there was a photo of my in-laws, SIL's family and us and she'll love to point (quite exactly) who is who. Eliza serious at work, peeling out the stickers on the orange..
Eliza had to do a blood test on Friday to check that she's immune from Hep B...it was an harrowing experience for both of us. Of course the wait drove me nuts as well...3 hours!!! It was also past Eliza's nap time and lunch time. But she survived on bread anyway. In the midst of the waiting, we had fun pointing out the stars (Eliza did the twinkle twinkle hand sign), she said 'bao bao', she started saying Elmo, she said 'bread'...all not the most accurate but i know she's saying it. So exciting! 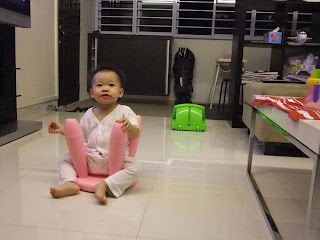 She found a new use for the Ikea stool...if i can't find it in the room nowadays, i know who has taken it.. 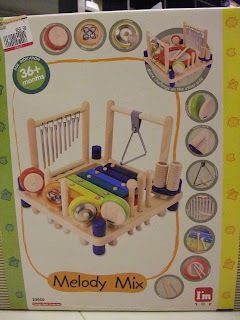 I thought looong and hard and for days before i eventually got this music instrument set. It was $119, but was on sale for $59.90 at the Take Baby Fair...i prefer toys like these over those battery operated ones. 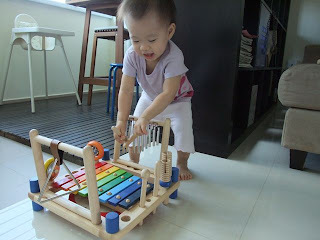 And this is one of the rare toys i do buy for her. 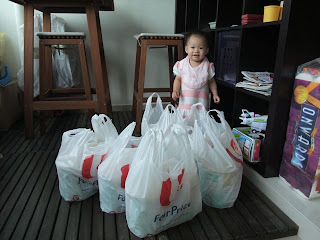 Last sunday...our $450 worth of milk powder...Eliza posing with it. You better finish it ah!! 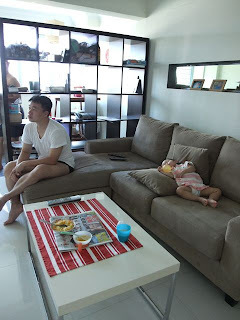 Last sunday, she was sooo tired out even after her late morning nap she continues to zzz on the sofa...if you realize, her porridge is there...it's lunch time and she's still snoozing.